Moving up to Franklin's Intermediate Badminton/Volleyball Set yields telescoping PVC poles providing playing heights to accommodate younger players. The rest of the set includes everything you'll need to quickly set up a sturdy net - the hardest decision is choosing what game to play. Moving up to Franklin&apos;s Intermediate Badminton/Volleyball Set yields telescoping PVC poles providing playing heights to accommodate younger players. 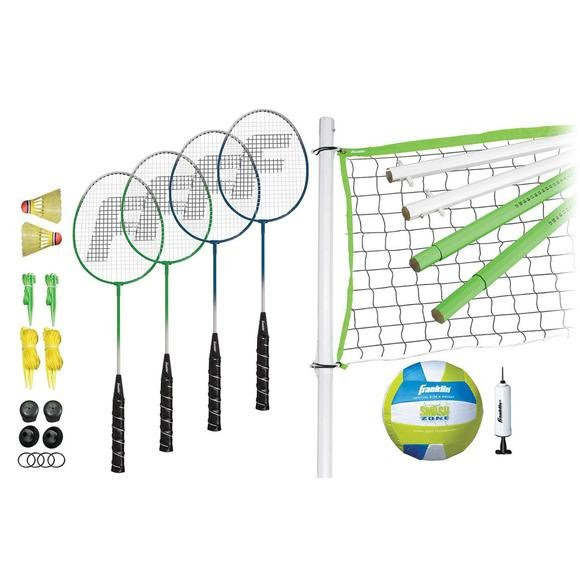 The rest of the set includes everything you&apos;ll need to quickly set up a sturdy net - the hardest decision is choosing what game to play. Keep the net assembled in your backyard or break it down to bring along to your next family picnic or company party - the traditional carrying bag makes storage and transport a breeze.